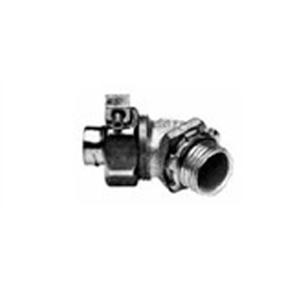 Appleton ST Series Plain throat liquid-tight 45-degree connector of 1/2-Inch trade size, has malleable iron construction and chromate epoxy powder coat/zinc electro-plated finish. This 1.25-Inch long connector with 1/2 NPT threaded connection, has unique long ferrule and polypropylene sealing ring with locknut standards. It is suitable for use with liquid-tight flexible metal conduit. Connector is UL listed and CSA certified.